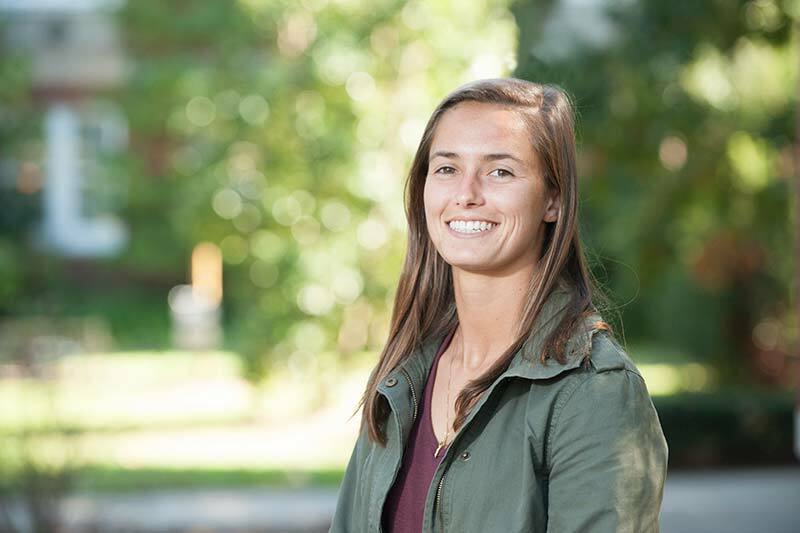 The USA South Athletic Conference recently presented former Meredith College women's lacrosse student-athlete Carlee Joseph her USA South's Female Don Scalf Award. USA South Commissioner Tom Hart was on the Meredith campus to present the award on Sunday, February 3. Each year the USA South Athletic Conference presents its most prestigious awards by honoring one man and one woman as the Student-Athletes of the Year. These student-athletes are recognized as recipients of the Don Scalf Award. To be eligible a student-athlete must be either a junior or senior, have participated in a USA South sport earning at least All-Conference recognition and have a minimum 3.00 GPA. The athletic directors vote for the award winner each spring at the conclusion of all Conference schedules. Joseph, the most-decorated Avenging Angel in program history, concluded her collegiate career last spring when she was named USA South Player of the Year for the third consecutive season. She added this latest honor to her Rookie of the Year accolade from three seasons ago to become the only USA South women's lacrosse player to be named Player of the Year three times plus Rookie of the Year. Joseph is the USA South's all-time leader in career goals scored and points accumulated. She is a three-time IWLCA All-Chesapeake Region first team honoree, was a member of seven conference championships (three regular season and four tournament) and participated in the NCAA Tournament four times. Joseph appeared on the USA South All-Conference team four times, was a four-time member of the Conference All-Tournament team, collected Tournament MVP honors once and was named the Meredith College Athlete of the Year the past two years. Academically, Joseph compiled a 3.885 GPA while on her way to dual degrees in May 2019, a mathematics degree from Meredith and a mechanical engineering degree from North Carolina State University. She was a Meredith College Pascal Scholar, an Impact Raleigh Scholar and a Hazel Lee Gaddis Engineering Scholar. Joseph appeared on Meredith's Dean's List eight times, was a four-time USA South Academic All-Conference honoree and a three-time IWLCA DIII Academic Honor Squad member. Finally, Joseph gave back to her campus community by serving as president of the Student-Athlete Advisory Committee this past year as well as volunteering for several local causes including Special Olympics and the Raleigh Rescue Mission while also organizing an event for the American Cancer Society which raised approximately $2,300. This award is named in honor of Don Scalf, whose commitment to the student-athlete, guardianship of the value of academic achievement and devotion to the principles of Division III athletics set a standard that holds steadfast in the conference today. He taught for 36 years and coached for 18 at N.C. Wesleyan College. He also served as athletic director at N.C. Wesleyan for six years. During his coaching career his teams won Dixie Intercollegiate Athletic Conference basketball and golf championships. In addition, he was a founding father of the DIAC in 1963 and served as its secretary-treasurer for 25 years.